From the 1958 sports car world championship emerged david browns finest achievement to date a road machine that exceeded its own publicists superlatives. The spectacular aston martin db 4 could attain maximum speeds over 140 mph and reach 100 in third gear. A good looker with this powerhouse, a driver was limited only by his courage and his respect for the law. Yet for all its prowess in the fast lane, the db 4 was still a member of the dignified aston martin family. It had the familiar aston styling, a balance between functional efficiency and beauty of line, and immaculate fittings. easy does it the only thing left was performance and the db 4 packed plenty of that. Thanks to its good torque characteristics and an innovative twin-plate clutch, the db 4 was a car anyone could drive. The servo-assisted disc brakes were fully capable of stopping the car at any speed without swerving, and the lateral a-arm front suspension made for smooth sailing. Priced at what for its day was a steep $10,475, the db 4 was still a bountiful bargain. At the end of 1959, a shorter gt version was offered, but the fans of open-air motoring could still opt for the cabriolet. 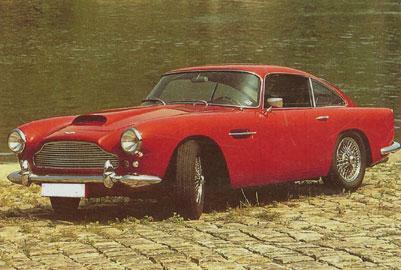 With smooth lines and an italian design by touring, aston martin introduced the db4 as a high-performance gt.